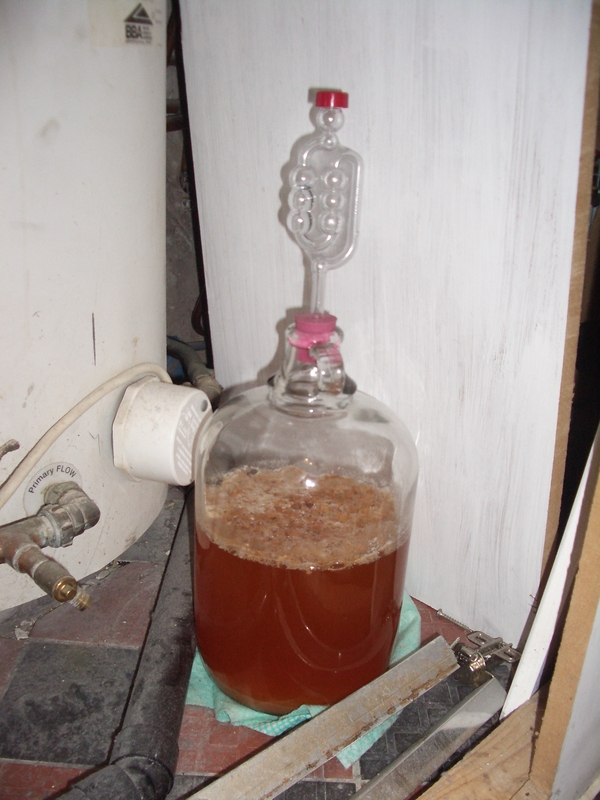 After a week of waiting, our cider finally seems to be doing something as you can see below. I spent quite a while looking at different cider recipes. I wasn’t keen on those which involved the use of lots of chemicals. I guess that’s to allow the cider to keep longer, but as we are only making a small amount, no more than 3 litres, that isn’t going to be an issue for us. Some recipes also advocated adding yeast to get the fermentation going. In the end I asked around among my friends who have made cider. Most of them had just put the apple juice in a demijohn with an airlock and left it to ferment, there being enough yeast in the apples to allow fermentation to take place. We decided to follow this advice and started off leaving the demijohn in the kitchen. Our kitchen wasn’t particularly warm last week and nothing much seemed to be happening. After a few days we moved the cider into the shower room where it sat next to a radiator. Still nothing happened. One of my friends then told me how he put his cider in the airing cupboard – we moved the demijohn in with the water heater and within 24 hours fermentation had started. We’re keeping our fingers crossed that the cider will be drinkable eventually. This year is a bit of an experiment, so I’ll post again to let you know how it turns out.